I continue my search for the stars. This conversation was initiated as part of the research for one of my art projects. K: You are an amateur astronomer, an observer of the stars, and as I understand it, to get an optimal observing situation you have to leave Manhattan? R: Yeah, light pollution is one of the reasons why I have to find an open space further from the city lights. The other reason is that we live in sort of a canyon here, built with tall buildings. And for most of the interesting stuff you really have to have a clear view of the southeastern horizon. A view like that, you can get in the south shore of Long Island for example. Yeah, you need to get away from the tall buildings so you can have an unobstructed view, and at some place which is reasonable dark where you can pick out some of the fainter objects in the sky. K: What do you have to say about light pollution? And another thing with light pollution; I feel that the younger kids, are never gonna really have the same kind of interest in something so basic as the sky, because they’re really not getting a good look at it. They can’t see it. I don’t think my kids have ever seen the Milky Way, something that I noticed at a very young age you know. My son is 19 and my daughter is 13 and don’t think they have ever looked up and really noticed anything in the sky. And I think mainly because it’s just…the view is just so uninteresting now. K: How do you think that affects them? R: Well I think a lot of things nowadays keep them from appreciating the natural world you now. I think they are perfectly happy spending all their time staring at a computer screen. They are not really interested in looking around seeing…the vastness of the universe. I think their world is very small now. K: Clear nights I have noticed a star or two above Manhattan, but of course nothing like the Milky Way, did you see it here in NYC as a kid, was that possible? R: Years ago you used to be able to see more stars. I can remember as a kid in Queens you know, looking up and seeing the Milky Way. Yeah it was visible, it was. K: What kinds of lights were there in the public then? R: Street lamps, but there wasn’t as many commercial lights [as today]. When factories closed for the night, the lights went off. There was no 24-hour super drive ins 7/Eleven´s, which were shining their lights into the sky, having these giant neon lights or whatever. There were no all night gas stations. You know, when it got dark it got dark. People turned their lights off. And very few people had security lights outdoors. I don’t think people felt the need for them then. I guess they felt also it would be a waste of energy having these lights on all night. I mean we never kept lights on all night! It was like a concept that was such a waste. K: It’s a strange development that we stopped caring about waste of energy. R: It is, it is. I saw a picture on the Internet the other day of Los Angeles in 1926, an aero view of it. And it was lights, you know, city lights. And then it was another one of Los Angeles in 2007 and that splotch of light was enormous, it was 10 times bigger than it was in the photograph from the late 1920´s! Not only are the lights spreading, they are brighter! It’s brighter! Times Square for instance…I think already when I first started to work in the city back in the 70´s, Times Square was bright with neon signs, but it’s nothing like it is now. I mean it’s blindingly bright! K: So what about your local situation where you have problems with too much light in your own backyard? R: I am planning on telling all my neighbors to shut their lights off. I told my neighbor across the way the other day: You know that light you got on all night, why do you have that for? He goes: Ahhh, my wife you know, my daughter, they think it’s people lurking in the darkness around their home, you know. People are so paranoid. They think that this light will actually keep people away; I think it does the opposite. If you are staring at a glaring light someone could be right next to you and you wouldn’t be able to see him. You probably would be better off with the lights out. You could probably be much more aware of what is in your yard. I think the light actually makes you blind. K: And maybe, since we are so exposed to light, the modern human eye, might be bad in seeing in the dark? R: You really don’t need a lot of light to see…we don’t realize that nowadays. I think we all just take for granted that everything has to be lit up to see it. I think if you just give yourself a chance, you’ll be amazed after 15-20 minutes or so, of just how much you can see. I think your eyes could see an amazing amount of things in the dark, cause they’re acclimated to it. K: I am curious about the reason for being fascinated about the world up there in the sky… to me to look out there it’s almost a symbol of how little we know. R: Or how small we are, or how insignificant in many ways, we are. Well, the astronomy thing is more about picking out very very small parts of that big thing and be able to observe them closely, see in detail that you can’t see with your naked eyed or even with binoculars. K: That knowledge, or the satisfaction you get from that…how do you profit from that in life in general? R: I like learning things, I like having this, what some people might call useless knowledge. But it gives me pleasure to now that kind of stuff. R: Yeah, there’s a certain amount of that. R: It really takes you outside of this human experience here, which can sometimes be very frustrating and very non-sensical with so much trivial stuff going on. And to look up into the sky like that beyond, beyond, beyond all of that, gives me a way of separating from that. Leaving all that worldly stuff behind me, I’m actually traveling through the telescope, you know outside this realm of human nonsense. Things that you worry about or are concerned about; when you’re in a situation like that an you’re observing these things that are millions and billions years old and change very slowly, if at all. It gives you a sense that ”this is really not that important”. K: To me it makes a difference to look up in the night sky when I think about that I might not be able to see the stars much longer. Imagine a future generation who has never seen a star in real life. It’s a future when the night sky has transformed into a thick layer of artificial light and micro particles that doesn’t let through the sight of any stars or planets, not even the moon is visible. What effect would that have on us and other life forms on earth? ”If you see something, say something”. The words are in black on the back of my train card. My first thought is that it is critical statement or a public art piece by someone like the artist Jenny Holzer or Barbara Kruger. I continue reading: ”If you see a suspicious package or activity on the bus, platform or train, don’t keep it to yourself. Tell a police officer or an MTA employee. Or call the toll-free Terrorism Hotline at 1-888-NYC-SAFE”. I am on the train, on my way to Times Square. The first thing I spot when I arrive and exit the train station, is a gigantic film screen right in the middle of everything. It shows a commercial loop that promotes people to join the American Army. I wonder if I should report it as a suspicious object in favor of terror? Times Square on the whole reminds me of 24/7 summer time twilight in the very far north of Sweden. I look up in the sky. It’s a clear night but no stars at sight in this particular spot. 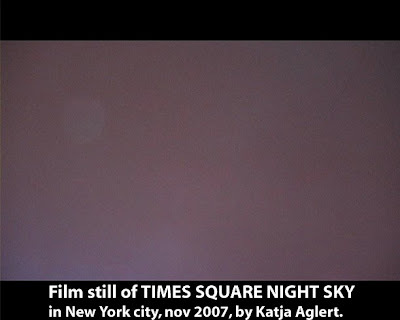 The lights at Times Square reflects the sky so that it looks bright and varies in grayish-pink, grayish-yellow, grayish-blue and grayish-green. To watch this sky is like looking down in a pot of boiling chemicals. I continue my walk a couple of blocks to the northeast and end up at the Top of The Rock to watch the night view from above. The sky glow is massive, a rainbow shaped orange shade that gradually turns to grey in the upper parts of the sky. An amateur astronomer born in Queens tell me that when he was a child he used to watch the Milky Way from his back yard. It’s now about 30 years since I saw it from Manhattan or Queens, he says. His children have never ever seen it. – there it is, the brightest spot on earth; NYC – our home! Light pollution is excess light created by humans, a side effect of industrial civilization. Among other consequences, it disrupts ecosystems, can cause adverse health effects, obscures the stars for city dwellers, and interferes with astronomical observatories. Its sources include building exterior and interior lighting, advertising, commercial properties, offices, factories, streetlights, and illuminated sporting venues. The entire area consisting of southern England, Netherlands, Belgium, West Germany, and northern France have a sky brightness of at least 2 to 4 times above normal. The only place in continental Europe where the sky can attain its natural darkness is in northern Scandinavia. In North America the situation is comparable. From the east coast to west Texas up to the Canadian border there is very significant global light pollution. In the 1800- and early 1900 century it was possible to observe stars from the Stockholm Observatory in the very city center in the capital of Sweden. To secure the possibility to continue observation of space from Stockholm at large another observatory was built in mid 19th century ”far” outside the city in a rural area, which today is a suburb 15 minutes away with the train. This observatory is of course, as well as the one in the city center not in use anymore. Nowadays, if we want to make proper observations of cosmos from Sweden, we need to go far north (about 1237 km/769 miles from Stockholm) to Esrange Space Center where they facilitate a huge light pollution safe area. Obviously we can grasp the importance to observe cosmos for astronomers, but why would it nowadays be considered of importance to be able to see the stars for everyday people? Some, like for instance Tom Callen who is an astronomer and producer at Cosmonova in Stockholm, points out the important not to loose connection to the night sky, since it’s in some aspects related to our origin of the universe. I ask amongst some friends what their connection to the stars is. One says that to her its important to be able to watch the stars to get that scale of perspective as it reminds of the greatness of life and what it means to exist. She points out it is not possible to get that scale of perspective anywhere else on earth, unless you’re standing on the top of for example Mount Everest. Since the early 1980s, a global dark-sky movement has emerged, with concerned people campaigning to reduce the amount of light pollution. The International Dark-Sky Association is a US-based non-profit organisation incorporated in 1988 by a group of astronomers in order to encourage darker skies (through lighting that creates less skyglow) in the USA, and, eventually, throughout the world. Another initiative for the purpose of darker skies is National Dark Sky Week which is a week during which people all over the United States are encouraged to turn out their outdoor lights in order to observe the beauty of the night sky. This event was started by Jennifer Barlow of Midlothian, Virginia in 2002 and through a mail correspondance with her I understand her ambition to also spread the idea with the NDSW internationally. The next time it happens is in 2008 April 6-12. Wherever you are, maybe you should give it a try?